Photo: William B. Sherman Farm, ca. 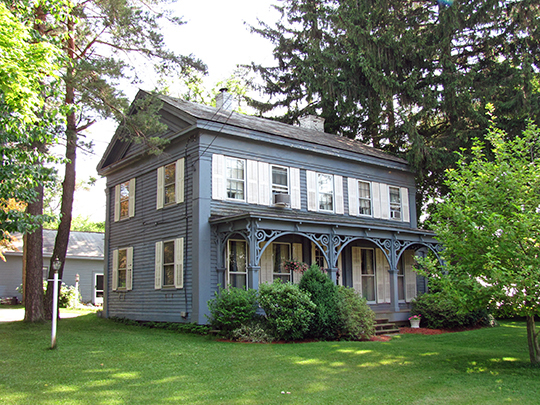 1825, 1072 State Road, North Adams, MA. Listed on the National Register of Historic Places in 1985. Photographed by User:John Phelan (own work), 2010, [cc-by-3.0 (creativecommons.org/licenses/by/3.0)], via Wikimedia Commons, accessed July, 2013. There is no county government for Berkshire County. State agencies assumed all county functions in 2000. Its historic county seat is Pittsfield City. The center of the Berkshire Hills is located here, and the county is often simply referred to as "The Berkshires." Berkshire County was created by the Provincial Massachusetts Legislature in 1761. The name was probably taken from the county of Berkshire, or Berks, a pleasant and important inland county in England, to the west of London. At the time of the formation of the county the line was not settled between Massachusetts and New York. It was settled in 1787 by the Reverend Dr. Eqing and Dr. Rittenhouse of Philadelphia and Thomas Hutchins, Esq., commissioners appointed by Congress at the request of the MA and NY. Berkshire was the last of the Commonwealth counties to be settled. Before the first French War, 1744, there were few settlers in Berkshire, but by the time of the second French War, 1754, the numbers had increased considerably. Most of the early settlers were of English extraction. They came from the middle and eastern parts of Massachusetts and from Connecticut and Rhode Island. A History of The County of Berkshire, Massachusetts, Samuel W. Bush, printer, Pittsfield, 1829.